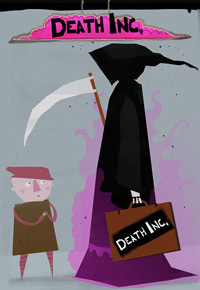 Death Inc. is an unusual RTS produced by Ambient Studios, in which the player's task, as a gloomy harvester, is to lead to the death of as many people as possible in England during the Renaissance. From some of the minds that brought you LittleBigPlanet, Fable and Burnout comes a pungent re-imagining of the Black Death. Guide Grim T. Livingstone, freelance reaper, through 1660's England spreading fear, pestilence and most importantly, the bubonic plague. Death Inc. is a freehand strategy game with no micromanagement or complex menus. Jaint your orders into the land and unleash your infected minions on serfs, wenches and noblemen. Use harvested souls to build your business empire and strive to become the greatest reaper the world has ever endured. As they say at Death Inc, not all plagues are bad for business! Expectations: 8.1 / 10 calculated out of 9 players' votes.